Strengthen your muscles with an effective whole body training. 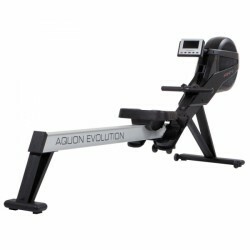 Experience an extremely realistic rowing with the Finnlo rowing machine Aquon Evolution. This machine challenges everybody - from beginner to trained athlete - with its resistance of up to 350 Watt. The stable aluminium rail with a length of 135 cm and the extra long pull rope of 182 cm allow users of a height of up to 2 metres a comfortable training. The Finnlo rowing machine Aquon Waterflow combines a stable steel frame with the advantages of a water rowing machine with wood applications. The two rails allow a smooth sliding and give a good and realistic rowing feeling in combination with the resistance of the watertank. The resistance can be varied in four levels means of an easy adjusting mechanism. 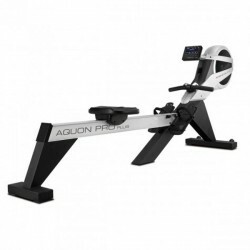 Purchasing the Finnlo rowing machine Aquon Pro Plus, you get a rowing ergometer developped by pro rowing athletes fulfilling even highest requirements. It is characterized by perfect sitting ergonomics and an optimal movement, and it is also used by pro rowers. 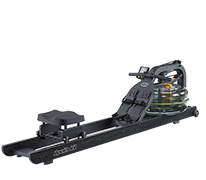 The approved combination of air and magnetic brake system provides a real rowing sensation like on water. The resistance adjustment is comfortably and quickly done on the rowing handle. The premium brand FINNLO represents the flagship of the range of products of the HAMMER SPORT AG and convinces by high-quality rowing machines. Conventional fitness machines exercise usually only single body zones. Exercising with a Finnlo rowing machine is different ! 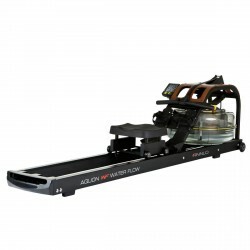 We offer the Finnlo rowing machine Aquon XTR in our range of products, an indoor rowing machine with a combined air/magnetic brake system. The constant rowing motion on the Finnlo rowing machine provides an especially health-oriented and varied whole body workout. Thanks to their quality and durability, Finnlo rowing machines contribute to protection of environment and ressources.